It wasn’t necessarily pretty, but the U.S. Men’s National Team took care of business against Guadeloupe on Tuesday night and earned a place in the knockout stage of the Gold Cup. 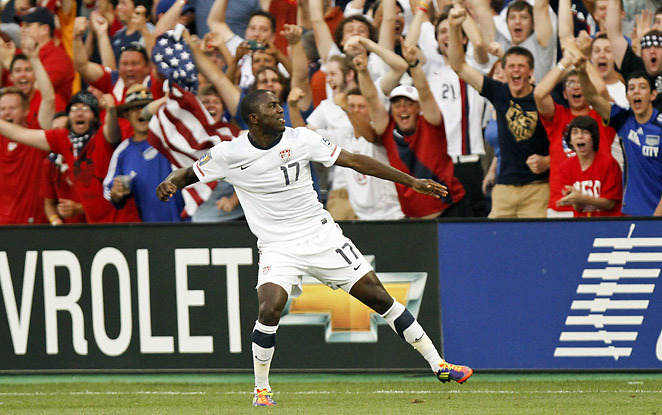 Jozy Altidore put the U.S. up 1-0 in the 9th minute with the kind of goal that makes him such a frustrating player. Altidore’s 25-yard blast showed just how talented he can be and makes one wonder why he can’t bring that same intensity every game. The Americans had plenty of scoring chances, peppering the Guadeloupe goal, but goalkeeper Franck Grandel denied them repeatedly. Clint Dempsey had an off night, missing two headers, hitting the post and somehow not getting a shot off when he was all alone with the ball two yards in front of the goal. Throw in uncharacteristic misses from Landon Donovan and Chris Wondolowski and the final score could have been much more impressive. Donovan’s right – we would have like to have seen the U.S. convert more of those scoring chances, but in tournament play the objective is to advance, and that’s what the team did. Now we’re left to wonder which team will show up on Sunday to face Jamaica – the Group B winner that has yet to give up a goal. The Americans have yet to play a complete game in the tournament, but they have been able to do just enough to get by. That was OK in group play, but they are going to need to bring a full 90-minute effort from here on out – especially with a date with Mexico looming somewhere on the horizon. The slate has now been wiped clean. What the U.S. team does now is up to them. Randy Lerner’s Aston Villa have gotten themselves into a twist in their attempts to hire Alex McLeish as their new manager. According to The Guardian, McLeish held talks with Villa officials at a secret location in London on Wednesday ahead of a proposed defection across the city on a three-year, £2m-a-year contract. At the same time a crowd of Villa supporters gathered in protest outside Villa Park while lawyers acting for Birmingham, McLeish’s former club, drew up plans to pursue their rivals for compensation and to defend the club against an anticipated charge of constructive dismissal from McLeish. Birmingham claims that Aston Villa struck a deal with McLeish before he resigned from Birmingham on Sunday – a resignation that Birmingham has not yet accepted. And the fans are less than thrilled, with one spray painting the message “Bluenose scum not welcome” on a wall at Villa’s training ground. Liverpool has unveiled its third kit for next season, taking inspiration from the club’s jersey of 120 years ago. It’s strange seeing blue incorporated into the jersey – kind of like if the Browns brought black-and-gold into their color scheme – but we see the historic nature of the kit.